Den Toom Luthier at the Iserlohn Guitar Festival 27th edition. Bill Kanengiser from the Los Angeles guitar Quartet playing Anniversary Den Toom luthier guitar "Lucy"
Showing Karl-Heinz Nicolli one of my guitars. Carlotta Zürn playing on "Lucy"
Visiting Museum Cité de la musique, Standing next to the Octobass. My Dream is to create a Guitar that has a great dynamic range with endless possibilities. To achieve this dream i make my guitars thin and flexible. This creats a very active and responsive guitar. Which even at low volume has allot of clarity. My body shape is compact. My guitars are very lightweight. I build guitars in the traditional Spanish ways with Hot Glue only. All my guitars are French Polished. My biggest inspirations are Antonio de Torres, Vicente Arias and Francisco Simplicio. There way of constructing and decorating have influenced me greatly. I look up to these 3 Legendary guitar makers. I have had the pleasure to see guitars from 2 of these makers. Vicente Arias and Antonio de Torres. I had the pleasure to play the Arias. It was a Cypress classical guitar. It was the lightest guitar i have ever played and seen. I was shocked to say the least. This guitar would make sound by the slightest of touch. It was amazing. Tim Panman, Theo de Blasis and myself before the Recordings and Concert. Duo Cruz&Souper playing Den Toom Luthier guitars for the closing Concert at the Iserlohn Guitar Festival Iserlohn. 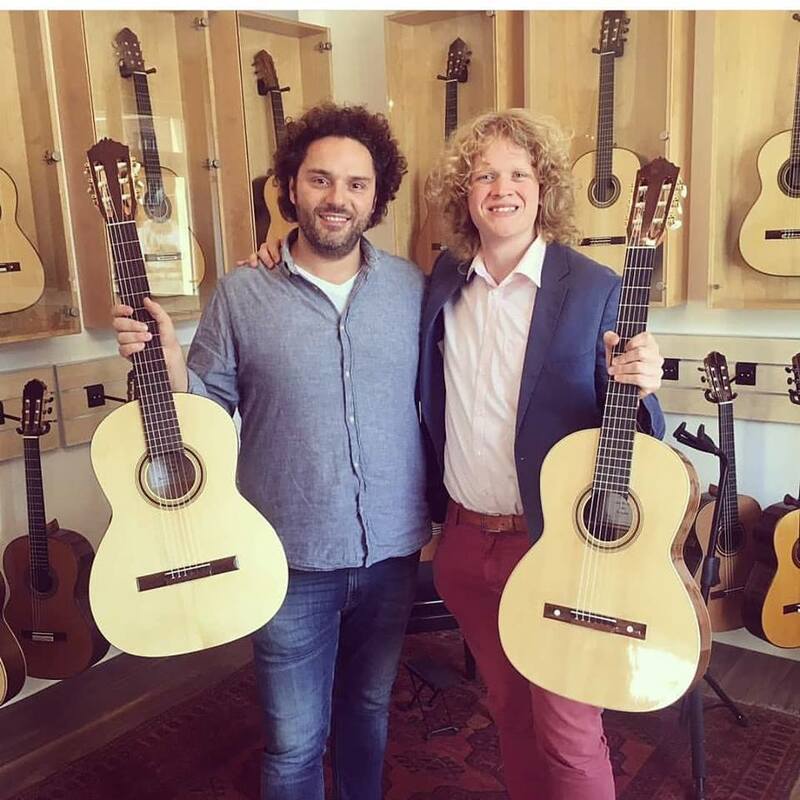 Theo de Blasis playing a Rosewood Den Toom Luthier guitar.